Let's be honest: decorating the Christmas tree is by far one of the best traditions of the holiday season. Each and every ornament has a story - the one your Mom gave you when you moved into your first home, the one you and your husband bought your first Christmas together, the one your Grandma bought for your family when you were celebrating “Baby's First Chritmas”. Putting them on the tree is an experience, one where you get to reminisce. It is not a process to be rushed! What makes this experience even more precious? When those ornaments are handmade. When you and your child or your friends or your Mom get to sit together and make them together, it makes the ornament that much more special! Handmade ornaments also make great gifts. 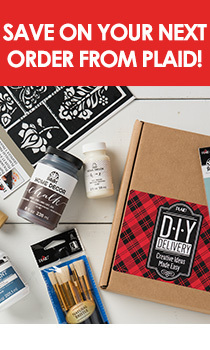 This is a collection of our very favorites, featuring our favorite craft essential: Mod Podge! Silhouettes are so classic and they're such an easy way to personalize anything. We love how easy these ornaments from Alice & Lois are, and they're so elegant looking! I love clean, wooden textures and I feel like this craft from Paper & Stitch really honors the integrity of those textures, but adds a nice little pop of color to keep it interesting! You simply can't go wrong with a classic decoupage, and we love the color that Sew to Speak brings to this DIY! This DIY from Mod Podge Rocks is a really great project to get your kiddos involved - the messier you get, the better these look! It seems like mason jars aren't going anywhere for a while - we love the creative usage of the mason jar lids in this DIY from Jedi Craft Girl. Everyone relates to maps because they remind you of where you came from, where you're at, or where you're going. That's why we love this DIY from A Diamond in the Stuff! Confetti makes everyone happy! We especially love the metallic sheen of these ornaments from Unusually Lovely.